Slow Cooker Pesto Minestrone Soup is packed with vegetables, and has about 125 calories and 7 grams of fiber per 1-cup (240 ml) serving. This recipe makes about 5 qts. (18 cups, 5.7 liters) of soup. While a 6 qt. slow cooker is ideal, you can make it in a 5 qt. cooker. If you have 3 or 4 qt. slow cooker, cut the number of ingredients by one-half. Yield will be about 2.5 qts. (9 cups). If 5 qts. of soup is too much, cut the ingredients in half to make 8 to 9 cups of soup. Your actual yield will very depending on the amount of carrots, celery, onions, beans, and pasta used. This soup can be made with crisp, crunchy vegetables or you can increase cooking time for softer vegetables similar in texture to canned soups. For crisp vegetables, start with the minimum cooking time; 3 hours on high and 6 hour on low. For softer vegetables, increase cooking times to 4 or more hours on high and 8 or more hours on low. Nutrition information is based on 1 cup of soup with 1 tablespoon of grated cheese (parmesan or Romano). Omitting the cheese saves about 20 calories and reduces the amount of protein by 2 grams. Homemade basil pesto was used in this recipe. Nutrition values for prepared pesto’s will very slightly. Canned soups may have little or no cheese (adds 20 calories to this recipe). Canned soups are thinner with more inexpensive broth than vegetables and beans. 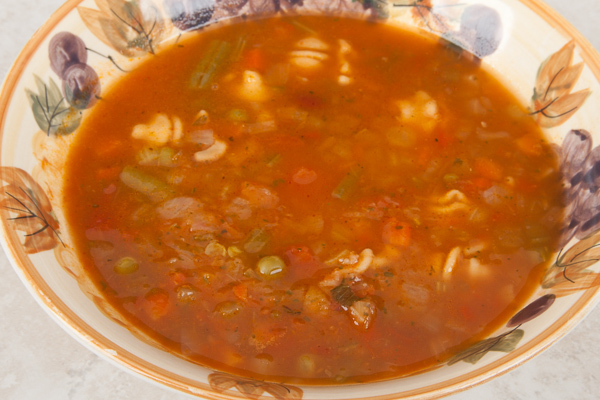 Minestrone soup is a very versatile recipe. Use can subtract or add vegetables or beans. Keep in mind, this recipe will easily fill a 5 qt. slow cooker. If you add other vegetable or beans, reduce the amount of carrots, celery, onions or other ingredients to prevent over filling your slow cooker. You can consider, cutting the recipe in half and making two or more varieties. Substitute 8 oz. (225 g) canned no salt added tomato sauce for one can of diced tomatoes. Use any variety of cooked dried beans or canned beans. Substitute kale, collard, or other leafy greens for the spinach. Add or substitute rosemary, dill, tarragon, or other fresh or dried herbs. For a thinner soup, increase broth or water and/or decrease vegetables. Note: Use a larger slow cooker if you increase broth without reducing the amount of vegetables or beans. Pasta will continue to absorb liquid while resting. For thinner soup, add 1 or 2 cups of broth or water if you are using a 6 qt. slow cooker. Place in your slow cooker the diced tomatoes, sun-dried, tomatoes, pesto, stock, water, garlic, herbs and spices. Stir to combine. Stir in carrots, celery, garlic and onions, Cover and cook on high 3 to 4 hours, or on low 6 to 8 hours. When vegetables are almost cooked to desired texture increase heat to high (if cooking on low in Step 1), add beans, zucchini and pesto. Cook, covered, about 30 minutes. Stir in pasta and cook, covered, 20 to 30 minutes or until pasta is al dente. Stir in spinach, cover, turn off heat, and rest 10 to 15 minutes or until spinach is wilted but still bright green. Serve topped with grated cheese if desired.